Since I had made pizza at my inlaws’ house on Monday night, I had an extra pizza dough here to use this week. I get it from Fresh and Easy and it really tastes homemade. 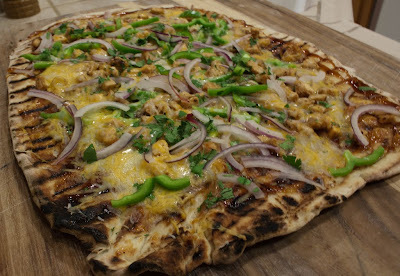 I decided to go with BBQ Chicken Pizza because it has been a long time since I made it last and I am much better at making pizzas now than I was the last time I made it. While the chicken is cooking, slice the vegetables and get everything ready on a board to take out to the grill. Once the chicken is off the grill, turn it back up to high and clean off the excess spices from the chicken. Just before you put the dough on, turn the heat down to medium. Dice the chicken and mix it with a tablespoon or two of BBQ sauce to prevent it from drying out. Roll out the dough and brush one side lightly with oil. This will stop it from sticking to the grates. Flip it on to the grill and let it cook until it is golden in color. This will not take very long, around 2-5 minutes depending on your grill. Brush the top side with lightly with oil and flip the dough over. 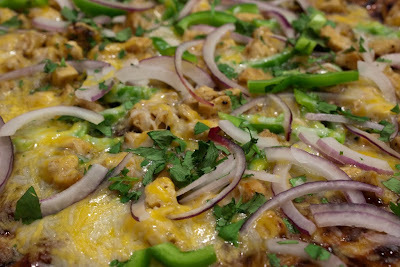 Working relatively quickly, put some BBQ sauce on the pizza, then layer on the cheese, diced chicken, peppers, onions, and cilantro. Turn the heat to low and close the lid of the grill. Let the cheese melt and the vegetables become tender. They won’t cook completely because there is no heat source on the top. 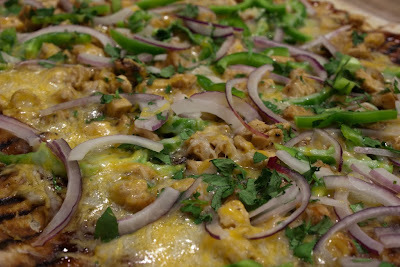 This works out fine for us because we don’t like to have cooked veggies on top of our pizza. To get the dough turned over and also off the grill, we use a big pair of grilling tongs. They work pretty well in conjunction with a big grilling spatula. Posted by galadriel07 on June 17, 2011 in General Food, Meals! This is how they started out. 1/2 pound of 80/20 meat in a bowl with a bunch of seasonings. I used Panko Bread crumbs instead of crackers and I left out the seasoning salt. I just put in as much as looked good of each item because I didn’t do a full recipe. I then cooked the bacon… a little too long it seems. With what little bacon I could salvage… one slice would have been plenty for this had I not burned it. I sealed them up really well… I thought I did anyways. Well, these are the completed burgers. They were a little burned and they definitely split open but they were still tasty! Shavenewok also encouraged Ratalon and I to go out and get some Tim Tams from Australia at the Wolrd Market. We also found Mint Slices made by the same company. TimTams are freakin awesome to the max! Posted by galadriel07 on August 15, 2008 in General Food, Meals!